Katherine Isbister, professor of computational media at UC Santa Cruz, has been recognized by the Association for Computing Machinery (ACM) as a distinguished scientist for her contributions to the field of computing. The ACM Distinguished Member program recognizes up to 10 percent of ACM worldwide membership based on professional experience as well as significant achievements in the computing field. Isbister's research focuses on human-computer interaction and developing new methods for improving the experience of interactive technologies. 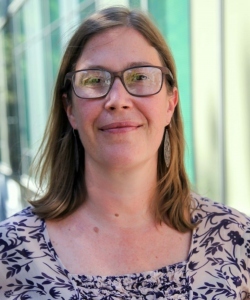 She is particularly interested in designing games and other interactive experiences that heighten social and emotional connections. She is the author of several books, including Better Game Characters by Design and, more recently, How Games Move Us: Emotion by Design. Isbister came to UC Santa Cruz in 2015 from New York University, where she was the founding research director of the Game Innovation Lab at NYU's School of Engineering. She earned a Ph.D. in communication and human-computer interaction at Stanford University. The Association for Computing Machinery is the world's largest educational and scientific computing society, uniting computing educators, researchers, and professionals to inspire dialogue, share resources, and address the field's challenges.